Follow your instincts and go wild in style. 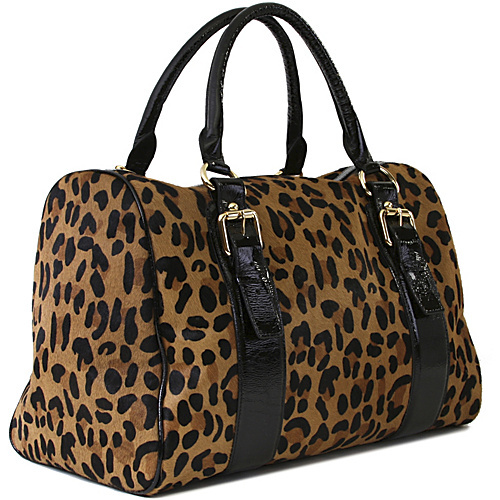 Super-luxurious haircalf with patent leather trim and shiny gold hardware in Black and Leopard. Classic leather goods with an edge. LODIS stands for sophisticated, traditional craftsmanship and refined materials fused with a bold modern attitude and thoughtful attention to detail. Established in 1965 as the creation of Loewe of Spain and Dan Segat, LODIS brought Madrid’s most exclusive leather goods house to the States for the first time. Loewe and Lodis’ heritage is founded in well-made, luxurious pieces. The name, LODIS, was created from this initial union, combining “LO” from Loewe with Dan Segat’s initials – DIS – to create LODIS. As the brand has grown over the last 46 years, LODIS has maintained its heritage by combining the beauty and time-honored tradition of fine leather goods with a self-assured design sensibility and eye for utility. Colorful, textured and vibrant, the LODIS collection of unique styles honors our heritage and moves forward with edge, confidence and style. LODIS. You know who you are. Get noticed.